Finally the USDA will do something right for a change. 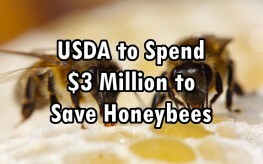 Just this week, the U.S. Department of Agriculture pronounced it would spend $3 million to help the nations honeybees in the Upper Midwest as an act to reverse the damage to bees and colony collapse disorder – linked largely to he abundant use of neonicotinoids and glyphosate. Honeybees pollinate an estimated $15 billion in crops every year. Many beekeepers bring their hives to the MidWest during the summer so that they can gather nectar and pollen for food, and then truck them to California to pollinate diverse crops from kiwi to rambutan, apples, alfala and pomegranates. There has been more than a decade of decline in honeybee numbers, with many theories exisiting for their demise. From pesticides and herbicides, malnutrition, genetically modified crops, viruses, and a lack of genetic biodiversity, our bees have been struggling. Both commercial honeybees and those in the wild have suffered from habitat loss and RoundUp ready poisons. Over the winter, some honeybee colonies have lost as much as 30% of their hive, and they usually use this time to store up strength and food for future seasons. Jason Weller, the chief of USDA’s Natural Resources Conservation Service says, this will be “a real shot in the arm” for improving bees’ habitats and food supply. Farmers will be given millions to reseed alfalfa, clover, and other plants that bees like to dine on. They will also be given funds to help build fences, install water tanks, and make other changes on their farms that keep an area from being inhospitable to bees. The USDA is targeting just five states since more than 30,000 commercial beekeepers bring their hives to these areas during the warm season. The agency is hoping to get a big bang for their buck – and while this is a great step in the right direction, it doesn’t address the underlying problem(s), such as GMO and the abundant use of neonicotinoids and glyphosate. Corn and soybean farmers will be given funds to plant cover crops – but if they are mixed in with GMO and herbicides, will this really do the trick? They have also resorted to feeding bees high fructose corn syrup. This has negative effects on people, so why feed it to bees? Why not just restore the natural ecosystem in which bees thrive? The USDA has partnered with Universities to study bee colonies and looks to many entomologists to recommend changes. Whoopdy do the USDA slaps a bandaid on a sucking chest wound. Typical Useless Government, incapable and inept. The genetic splice of the bacillus thurigennis in corn and soybeans (sugar beets?) paralyses digestive bacteria thus killing by malnutrition or poisoning the host ..it used to be a powder you had to spray a couple of times weekly topically ..now its poison in our food ..why care? well the pollen has the BT gene- the whole plant is poison and pollen is part of the plant .. so bees cannot predigest the honey as they are being poisoned by the pollen even without glycophosphate take-up through the root system.Possibly worse is beekeepers feed bees with hi fructose corn sweetener which is poison.even sugar from sugar beets may be spliced with bacillus thurrigennus (I don ‘t know.) When business buys politicians media etc this is bound to happen Its to them just collateral damage for the bottom line…profit at any cost .Our satellites are melting the icecaps with their constant radio microwave signals .Scientist warned of human health effects from non ionizing radiation ,and lost their funding (jobs)…. you are rarely an employed scientist nowadays unless you are a yes man for corporate interests re; oil l (pharma) environmental etc..we are running off the rails of a crazy train (OZZY} PS Baccillus Thurigennis was pre developed by Russia during the cold war as a chemical warfare experiment USA picked it up and developed it as atypical pesticide after the russian project was abandoned for lack of funds. Lastly radio microwave signals have been proven to interfere with mitosis (cell division) maybe pythons aren’ t the only culprits for decimation of species in the everglades.